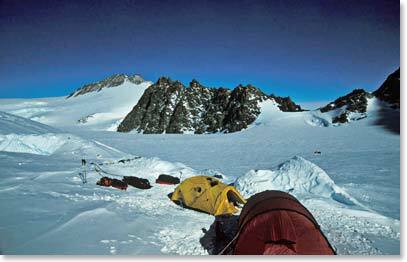 It is Friday, December 3rd and I am calling you from our high camp which is more than 3,300ft/1,000m above our Camp I. We are now camped at about 12,400ft/3,700m and it is feeling a lot like Antarctica. Yesterday we ascended the fixed lines up a steep head wall, mostly snow and some ice and rock. This section was 1,200 meters with intermediate anchors on the fixed line all of the way. Kate and John had to push their mechanical ascenders with a safety carabineer to make sure they were secure when they were passing many anchors. As I described to you earlier the warmest it has gotten so far is -15°C. With the sun beating down on us as we ascended yesterday, it was quit hot. Pachi kept telling us that when get to the top and go around the corner we have to have all of our warm clothing out because the wind is going to pick up, and certainly it did. We traveled the last 2 hours into our high camp with our hoods up and goggles on. Kate could describe to you some of the frustration of using goggles with your hood up and without fogging being a problem and we did work all of that out. True to the forecast, not long after we arrived at high camp we saw the high clouds begin to lower and the winds picked up even more. Right now I expect it is about -35°C and we do have wind speeds in excess of 35 to 45 knots. So we are staying cozy in our tents. We have had some key words on our trip so far: “patience” , “confidence”, and here at high camp in the storm “cozy”. You’ve got everything you need in these small, mountain nylon tents. You have to keep very organized and keep warm in your sleeping bag. You need to know where your gear is and of course in the long hours of the storm you just have to stay cozy, and drink your water. We are set up with plenty of food in our tents as well and are waiting out the storm. 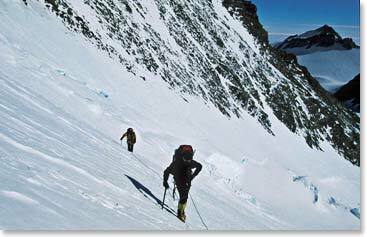 True mountaineering tradition, that is what is going on in Antarctica with the Berg Adventures Vinson climb. In this storm Kate, John, Pachi, Flat Stanley, and I are all secure and cozy at high camp.